Paris St-Germain striker Zlatan Ibrahimovic has been voted Ligue 1's players' player of the year for the second season in a row. The 32-year-old scored 25 league goals as PSG won the French title with a record 86 points, as well as scoring 10 goals in eight Champions League games. "For the second year in a row, it's a great honour," the Swede said. "I want to thank my team-mates, the coach, staff and supporters. I think this has been my best ever season." He added: "The whole team had a magnificent campaign. I hope in the years to come we win the league, both cups and the Champions League as well as all the individual trophies." 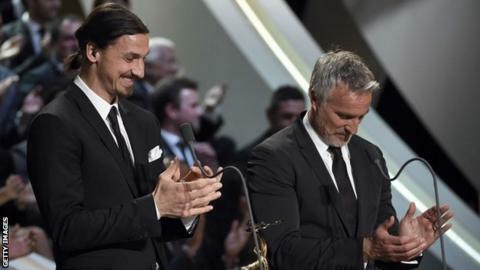 Ibrahimovic also won goal of the year for a brilliant back-heel in a 4-0 win against Bastia back in October. Team-mate Salvatore Sirigu won the goalkeeper of the year, while PSG midfielder Marco Verratti has won the young player award.